"As much fun as creating an artizan crumpet factory for an octopus is, nothing can quite beat that sense of progress you get from the traditional Animal Crossing games." Unlike other Animal Crossing games, Happy Home Designer doesn’t just drop you off in the middle of nowhere with a massive amount of debt to pay. Nor does it have a 24-hour day cycle, fauna to catch, or bells to earn. What it does have, however, is one of the most perfectly executed and unbelievably charming sets of design tools I’ve seen in gaming. 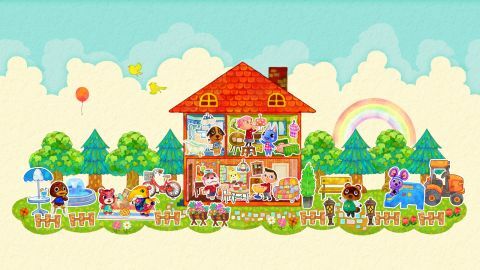 This series spin-off sees Animal Crossing’s usual weird menagerie of hamsters, squirrels and rhinos propositioning you for your design skills to help them create bespoke homes to their personal tastes. As a recently hired employee of Nook’s Homes it’s up to you meet the demands of these visiting villagers in tandem with your workmates: a pair of otters and a dog. You start off small, jazzing up small rooms and the like, before unlocking full houses with gardens, and eventually designing town facilities such as shops and a school to bring your sleepy little town back to life. Requests range from the simple, such as ‘chic furniture with a relaxed atmosphere’ put in by a sheep, to the bizarre, such as ‘a secret vacation spot for superheroes’ requested by a pink gorilla in a power ranger helmet. It makes for a great variation in the types of projects you can choose, so no matter your tastes you’ll find something that suits your style. Your options are also completely different to those of your friends. Aside from the first few rooms that act as a tutorial, the villagers that turn up in your town are completely random. Every project you take on introduces a handful of new furniture pieces, making for a steady trickle of design options to unlock as you progress. After playing for 30 hours I’m still getting new decor items to play with. You’ll find everything from lampshades to spaceship control stations, all of which can be shunted around to your villager’s specifications. Most of them are pieces you’ll recognise from all the effort you spent hunting them down in other entries the Animal Crossing series, but there are also a lot of new household items to play with, such as a vast assortment of food types to place on kitchen tables or in restaurants, or more mundane office equipment. The art of pulling all of these pieces together for your fabulous interiors is incredibly intuitive. Simply pick a bed or lamp from the bulging furniture menus and it’ll drop into your new room. From there it’s just a case of dragging it to the right spot with your stylus and tapping it to rotate it until it’s facing the right way. As you unlock more coffee table and plant pot variations the menus do become a little unwieldy, but there are search functions to help cut down the need to scroll through the endless lists of armchairs. You can also access more complex design options by spending play coins and studying your hand book. Tools such as the sewing machine, which lets you create your own patterns or import them with QR codes, are unlocked this way, as are functions like being able to choose a different floor plan, or hang things from the ceiling. It all adds up to a surprisingly powerful set of tools that will help you create anything you want. Yep, you can even build that hat museum you’ve always dreamed about. Download the day-one patch and you’ll be able to upload any of your designs online for the world to see as well as browse what other people have done. While I had thought I was making the most of all the different bookshelves and fruit-shaped chairs available to me, players in Japan (they’ve had the game for several months already) have put my designs to shame. From a concerningly realistic convenience store, carpark included, to an incredibly detailed recreation of the bath house from Spirited Away, there’s loads to take inspiration from. But all this creative freedom does come with a drawback - there are no consequences to designing something badly. I took a personal dislike to Coco the terrifying, gyroid-face bunny with a dead stare, so I made sure to line the entrance to her garden with a matching row of fart-noise gyroids and modelled her living room after an underground death pit, but she didn’t seem to mind at all. The only way you can do something ‘wrong’ is by binning the few possessions that the villager started with, and even then it prompts you to put them back again to complete the design. As far as your far-too-trusting town folk are concerned you can do no wrong, even if you turn their ‘tea house’ into a rotting prison, just as long as you include their beloved sofa in the corner. And while you’re free to design anything you want for others, you never have a home to call your own. As much fun as creating an artisan crumpet factory for an octopus is, nothing can quite beat that sense of progress you get from saving all of your hard-earned bells to buy a space suit, or the feeling of pottering around at midnight on the lookout for beetles in one of the traditional Animal Crossing games. I've loved my time with Happy Home Designer, but I still crave the freedom of New Leaf. You just can't beat strolling around a town of your own design, collecting bugs and fish to further improvements. Ultimately what I really want is to take everything I've learned from designing rooms for frogs and take it back to my New Leaf town for my own personal use. If the two concepts are ever combined my loved ones will probably never see me again as I turn myself into a shut in, but for now this is a fantastic way to tide yourself over until that glorious day comes. Description Make new homes for your friends, with added amiibo cards.